Next → Next post: Frankston line: $100m of upgrades coming. What’s included, and what isn’t? While they didn’t demolish any houses for the above, it would still have cost $$$ to build, even compared to constructing a normal freeway. It has plenty of faults, but “taking up too much space” seems a bizarre claim about the Eastern Distributor. It was designed very compactly and takes up less space than any other freeway I have ever seen or used. In fact it was designed with so little space for on-ramps and off-ramps that some of them are unusable because they are too short. Just don’t let them con you with the “slot” concept. @enno – looks like I didn’t proofread my comment – I meant to say the Eastern Distributor *doesn’t* take up much space. A spread diamond interchange has a large land footprint and as it’s the most common type in Melbourne so I understand why you have referenced it. However a single point urban interchange (SPUI) whilst more costly is far more likely to be used in compact urban areas as they are more efficient interims of land take and traffic capacity. A typical example of a SPUI would be Toorak road/M1 or Springvale Road/Eastlink however these examples are not particularly constrained and could be tightened up further to be more like the eastern distributor example. I also don’t understand why you say the ramps couldn’t be in tunnels many tunnels throughout the world have merges and ramps inside as Marcus pointed out. Even the Burnley tunnel has a merging ramp for the Kingsway onramp in the tunnel portal. Also wasn’t the argument that there was next to no cross city traffic or demand and that most of the traffic is city bound the same that was used against the Domain and Burnley tunnels. If the argument was true Alexander Parade and Batman Avenue would have had a lot more pressure in recent times for expansion and there wouldn’t be effectively a single lane of exits for city bound traffic from the South East with 3 lanes for people destined largely beyond the CBD. I think your failing to recognise that a large number of freeway users are accessing areas that are poorly serviced by PT mostly beyond the inner core… Also interims of access points I suspect there will only be a very limited number (say 2 or 3 max Hoddle to Tullamarine) to save costs by reducing the number of portals. @Austin, so the solution to poor PT services is to blow so much on an inner city road tunnel that there’s no money left to improve PT? Firstly I think we often look at “road funding” as only benefiting one user (perhaps with good merit given the broad historical context) and that is single occupant vehicles. I personally think it needs to be looked at more broadly with all road users that benefit. I haven’t heard a lot of public transport advocates looking at EW link and what the public transport opportunities could be included with such a project (apart from saying a rail line should also be considered in the tunnel). It sounds like Eastlink all over again with only a “rail corridor” included in the median at games end. -Improving the priority and access provision of the 7 tram routes that cross the existing above ground route between Hoddle and Tullamarine alone. -Examine bus priority and traffic calming to the aboveground environment that’s retained. -A smart bus route between Caroline Springs and Doncaster Shopping town with interconnection to other routes at interchanges including interchange bus priority. -An integrated cycle network along the corridor. -Turning the above ground area into and interconnected green space. Whilst the project is in its uncommitted form it is probably the best time to influence and change the project and ensure the best outcomes are achieved for PT. By simply saying I object to the project outright, it should never go ahead, and offering little else in the way of input what potential PT opportunities/road user opportunities are missed or not considered. Often people see transport funding/outcomes largely as an interchangeable item. Largely I think this is incorrect to the extent that it is only as interchangeable as the user the funding is targeting is. For example how often is it said that more freight should be moved on Rail rather than Roads implying its largely interchangeable (fundamentally this commonly shows a misunderstanding of the road freight industry, the function it performs and its structure. How many people hear this and think of semis driving aimlessly up the Hume from Sydney to Melbourne for no good reason and not appreciating how diverse the task they perform often is and the ultimate origin and destination of the task performed). PT needs to look at all the opportunities for funding including how it can maximise the benefit from some inevitable level of “road funding”. As a side note ensuring PT is considered and added to the costs of “road projects” cant hurt the prospect/BCR of stand alone PT projects. This road is just another faux revolution to road congestion!!! I am totally against this new freeway. It will destroy inner Melbourne and put more traffic on the freeway. New toll roads around Australia are not very used and public transport patronage will continue to grow. Oil prices are rising, oil is becoming more scarce and cars/rego/insurance etc. is getting more expensive. This just shows that Tony Abbott only knows what’s best for Tony Abbott. Why aren’t I seeing protestors like back in 08 regarding this road for?? We need a big mob to prevent this!! Hospitals and schools need funding. The only road project we should have is separating level crossings and fixing dangerous roads. In response to Marcus, the ramp was used right up until Citylink was done. There were two outbound ramps for Church Street – one turning north and the other south. The first was labelled ‘Richmond’ and the loop ramp ‘Prahran’. 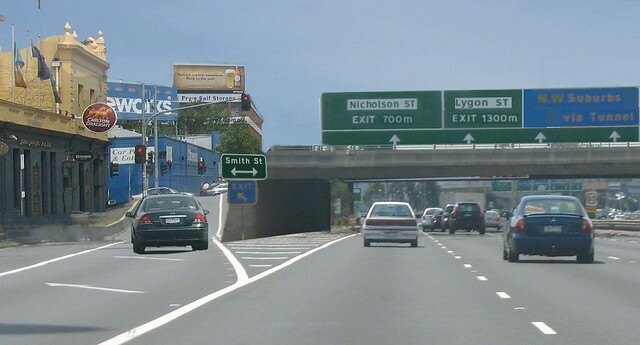 As it was a poor layout they closed the loop ramp – it used to have an amber flashing light at the nose for safety … And yes the Eastern Distributor is a more appropriate comparison for an interchange layout than the Forster Road which was reserved for well before the Mulgrave Freeway was built there in the 1970’s. The problem with your theory is that, with a few notable exceptions, buses don’t make use of the freeways and time-saving road improvement.